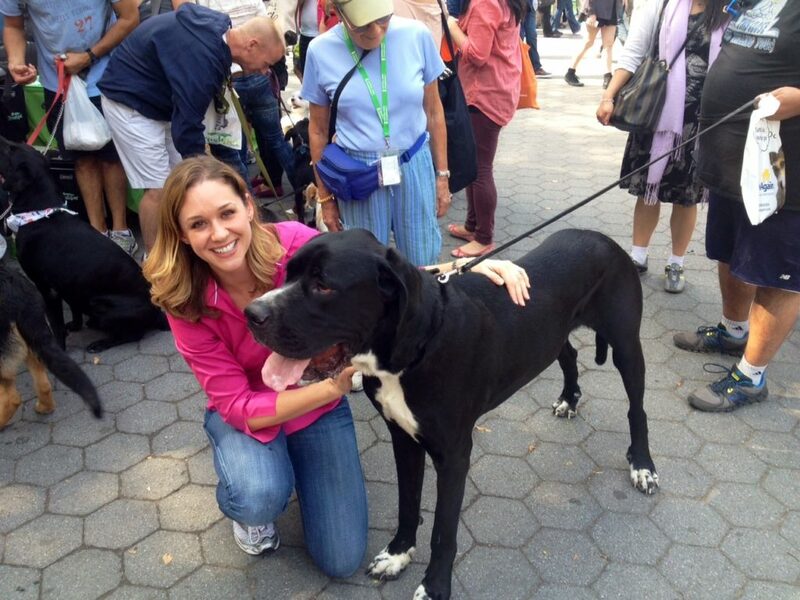 We had so much fun at last Saturday's My Dog Loves Central Park Fair in New York City's Central Park. It was such a beautiful day outside and we loved getting to spend so much time with hundreds of pet parents. There were so many different breeds of pups there that we just couldn't get enough! We brought the Freshpet Truck with us, which is always a big hit with human kids and fur-kids alike. With pet statues on top and huge pet stickers, it's becoming a My Dog Loves Central Park Fair icon. Between 11am and 3pm, pet parents and their pups walked up and tried free samples of our delicious food and treat recipes. Each pooch that stopped by got to take home one of our one pound Freshpet Select Slice and Serve rolls to try at home - talk about lucky dogs! We also brought boxes and boxes of our Dog Joy Chicken Treats, Dog Joy Beef Treats and Dog Joy Turkey Bacon– the pups were gobbling them right up. 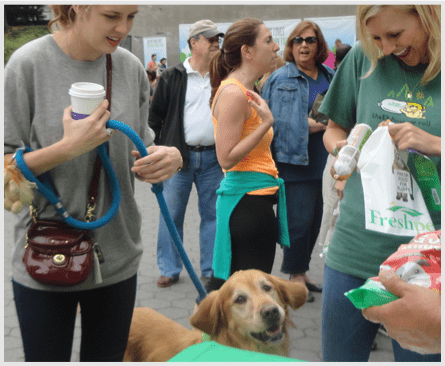 Freshpet friend and veterinarian Dr. Katy Nelson joined us for her first My Dog Loves Central Park Fair experience too. She helped the Freshpet team greet the park patrons and hand out samples to all of the pups. It was so great to have her on hand, and we think that pet parents would agree. Dr. Katy not only answered many pup-related questions, but she also helped people sign up for our Freshpet Fridge Challenge to have a chance to win free Freshpet for a whole year! We love going to local events like these because they remind us of the strong bond between people and their dogs. Every sample we handed out and pet parent we talked to reminded us of why we love what we do. When we see the way pups and their parents interact together, its clear why keeping their dogs healthy with nutritious, fresh food like Freshpet matters so much. There were so many exotic breeds there too – including a Puli! He was so sweet and posed for many pictures because the kids absolutely loved him. 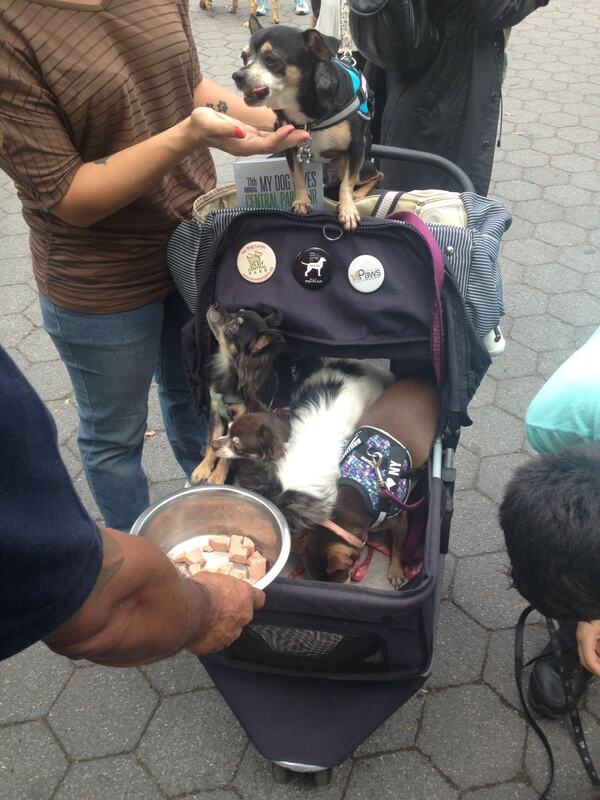 But our favorite part of the day was when a stroller full of chihuahuas came by around 1pm. Their mom brought them over with these adorable collars and they were just the cutest. We gave them the Dog Joy Turkey Bacon treats and they couldn't get enough – every Freshpet team member was spoiling them rotten! We can't wait for next year's My Dog Loves Central Park Fair! To see where you can find the Freshpet truck next, be sure to click here.